Many comics legends have worked on Miracleman, but no run on the series is as fondly remembered as Neil Gaiman and Mark Buckingham’s, cut short before its time. But now Marvel isn’t just remastering Gaiman and Buckingham’s original comics, but letting them finish the story they began 25 years ago. We’ve known about Gaiman and Buckingham’s Miracleman for a while, but this our first look at Marvel’s remastered versions of the original comics from the 1990s. Gaiman and Buckingham took over Eclipse’s Miracleman comics with Miracleman #17, kicking off an ambitious new story about the superpowered “parahuman” Miracleman ruling over a utopian society that would’ve encompassed three six-issue “Ages”: The Golden Age, The Silver Age and The Dark Age. Sadly though, Eclipse folded in 1994, with only two issues of the Silver Age arc released. 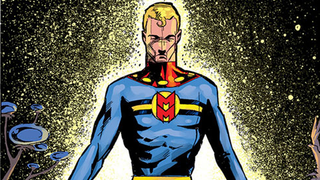 Miracleman found himself wrangled in legal issues of ownership between Gaiman and Todd McFarlane in the years since, until eventually Marvel announced that they purchased the rights to the character in 2013—allowing Gaiman and Buckingham to finally return to finish their saga. Gaiman and Buckingham’s Miracleman will begin with remastered versions of the first eight issues of their run, with new colors and lettering from original Inker and Letterer D’Israeli and Todd Klein. On top of that, these issues will also feature bonus added material from behind the scenes of the original comics, including concept sketches from Buckingham and Gaiman’s original scripts. And after that, Gaiman and Buckingham will return to finish both the Silver Age and Dark Age storylines as the series progresses. It’s not every day you get to see new comics material from Neil Gaiman, but the chance to see how his take on Miracleman would eventually play out? Err, yes please. Gaiman and Buckingham’s Miracleman #1 will be out September 2nd—you can go to the link below to see a few more preview pages.